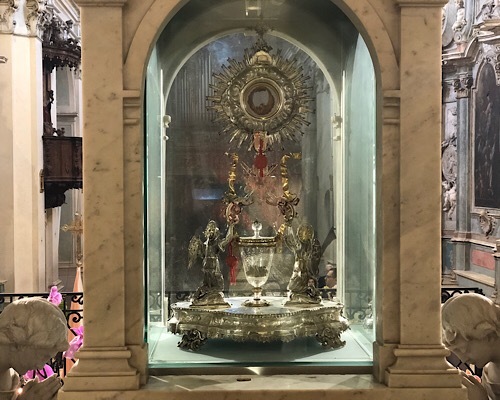 One of the highlights of our trips is a stop in Lanciano for the magnificent Eucharistic Miracle. It is set up so you can get right up close and intimate with Miracle. We had Mass in front of the miracle and Fr. Frans delivered another homerun homily. After Mass we drove through the beautiful countryside along the Adriatic Sea until we arrived at St. Michael the Archangel’s Cave. People of been visiting this for centuries and has 1 million visitors a year. Then we ended up in San Giovanni Rotondo where we had some free time and a restful party before dinner with wine, cheese bread and salami. Then a nice dinner and good night sleep. Tomorrow we visit the Body of Padre Pio.